Under the mirrored surface of the water there lies a whole new world. Graceful fish swarm and swim weightlessly in circles. While looking at our unique KunstLoft paintings, a feeling of freedom spreads through you as your eyes wander through the endless sea. Time seems to stand still in the fascinating underwater world and put the viewer under an incredible spell of tranquillity. A foreign world reveals its beauty between vibrantly coloured coral and crystal clear water. The art world cannot resist this magic and immortalises these inspiring scenes on canvas. and become part of a colourful spectacle. The mystical water, which in its cool nuances ranges from turquoise to black, complements the luminous tones of the sea creatures. Discover your favourite sea motif in our exclusive collection and let the cool water flow into your home. Create your own personal underwater world with amazing marine animals. The delicate fish and marine animals bring on thoughts of dreamy beach holidays in Greece or an exciting snorkeling class in Australia. Stop dreaming of painterly scenarios and bring them into your living room instead, where you can enjoy their positive vibes every day. Do you prefer to stay above water? We offer exclusive paintings with ships and boats that will put a smile on every sailing fan’s face. You’ll find the right motif from us in outstanding quality, at an affordable price and always hand painted. 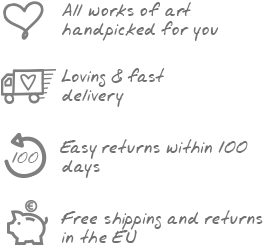 Don’t wait any longer and choose an impressive artwork from KunstLoft. Handmade paintings of fish and marine animals bring a dazzling variety of colours into your home. Witness the virtuosity and attention to detail that lies in the brushstrokes of these canvas paintings. Become a proud owner of and enjoy a lovely work of art.